The name Wikipedia comes from the combination of ‘wiki’ and ‘encyclopedia’. Basically, it is meant to be an encyclopedia written in the wiki format. 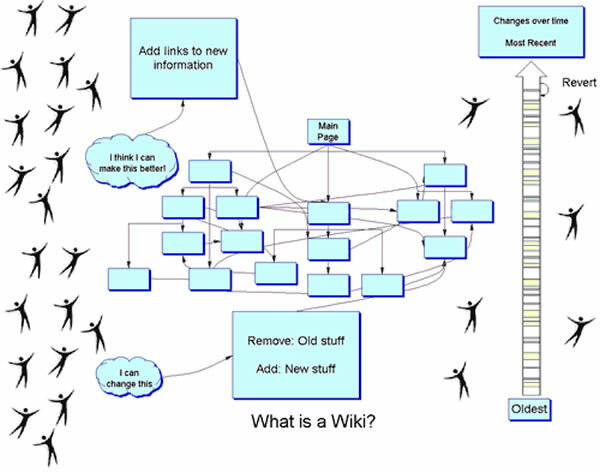 A wiki is a collaborative website, meaning it is a website that is created and written by a bunch of people as a group rather than individually. This means that a single page can be written by and edited by numerous different people and at the same time. The term ‘wiki’ comes from Hawaiian meaning ‘quick’. Wikipedia is a free-content encyclopedia project that is supported by the Wikimedia Foundation. However, the Foundation only pays for the servers to host the website and the few engineers that are hired to address any technical problems with the website. The entire content for the thousands of pages of the website is written by enthusiasts around the world, and they do it for free. Technically, anybody can make changes to the webpages and even create new pages. In fact, the Wikimedia Foundation is a non-profit organization that mainly runs on donations. So, not only do the writers work for free, the costs of running the website are also paid by the people who use Wikipedia by donating money to the foundation. Now the major concern for most people is that if anyone can edit the page is the information on the page accurate? Yes. Though it might not seem like it to people, the information on the page is usually pretty accurate. The reason behind this is people usually only edit the page if they are sure their information is accurate. Even if it is not, once they edit the page, the information is there for everyone to read it. So if someone else or an editor of the page sees the incorrect information they immediately flag the information (i.e. to be checked by other editors) or edit the incorrect information themselves. Hence, the information on the page is constantly written, checked and edited, all in real time and by hundreds of people. This ensures that the information is correct and up to date. However, just to be on the safe side, it is a good practice to source the information from more than once source, just to ensure of its authenticity. Today, Wikipedia is the sixth most visited website in the world with 374 million unique visitors monthly. The website has more than 70,000 active contributors who are actively working on more than 35,000,000 articles in 290 languages. Of these only 5,049,951 articles are in English. These numbers are only growing and are steadily helping Wikipedia achieve its ambitious goal of compiling all human knowledge into one archive that is always up to date.